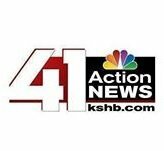 News TV Channel / KSHB-TV, virtual channel 41 (UHF digital channel 42), is an NBC-affiliated television station serving Kansas City, Missouri and Kansas City, Kansas, United States. The station is owned by the E. W. Scripps Company, as part of a duopoly with independent station KMCI-TV (channel 38). The two stations share studio facilities located on Oak Street and Cleaver Boulevard in Kansas City, Missouri; KSHB maintains transmitter facilities located at the Blue River Greenway in the city's Hillcrest section.